For the first time ever, a heritage project from Serbia – the Conservation Study of the Village Gostuša in Pirot District – received a Grand Prix of the EU Prize for Cultural Heritage / Europa Nostra Awards in 2016. 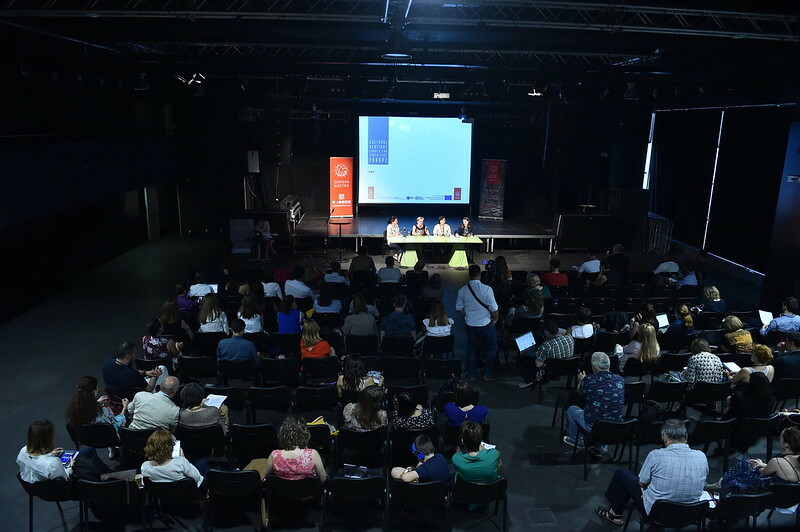 This exceptional heritage achievement was spotlighted during the second day of the Conference Cultural Heritage Counts for (South-East) Europe held in Belgrade from 15-17 June. During the panel discussion “Heritage, Environment and Sense of Place”, which was moderated by Lejla Hadžić, Head of Cultural Heritage without Borders Albania and Board Member of SEE Heritage Network, two case studies from Croatia were also presented and discussed. The first lecturer, Ivana Cvetković from the Institute for the Protection of Cultural Monuments of Niš (Serbia), presented the Conservation Study of the Village Gostuša, a key example of heritage-led regeneration of rural areas. She emphasised that the biggest challenge is the implementation of the Conservation Study of the Village Gostuša: “We are in contact with all relevant institutions and we want to share our knowledge with young people who will continue to develop the Gostuša project. In addition, together with the local government, we want to establish a Local Support Centre to assist people how to further develop the village and how to get in touch with possible donors willing to fund the implementation of this project.” Gostuša, also known as a “stone settlement”, is located in South-East Serbia in the area of the “Stara Planina” Nature Park, and represents a unique mountain village, being listed as national cultural property. The village was almost abandoned in the 1970’s. One of the main aims of the project is to revitalize life in an authentic village where only 80 people, mostly elderly, still live today. Ivana Cvetković pointed out that in two campaigns, more than 20 experts and students spent around two months working in the field, followed by a team of three architects for a full year completing the work in the office. The project manager was Elena Vasić Petrović, Architect Conservator. The experts’ group, which consisted of architects, an ethnologist, a archaeologist, a photographer and an historian, worked together with a group of students from the Faculty of Civil Engineering and Architecture of Niš. Ivana Cvetković also highlighted the main outcomes of the project: it created the strategic framework for the sustainable development of the village, harmonized development plans within the framework of the international principles and conventions, and brought forward the proposal for inscription to cultural heritage list of the Republic of Serbia. The project also provided protection through documentation – over 350 conservation and valorisation cards for all buildings in the village, over 150 architectural drawings and photo documentation for some 60 different objects were produced. Julia Bakota from NGO 4 Grada Dragodid, Šapjane (Croatia), explained the project Preserving Dry-Stone Masonry Techniques of the Eastern Adriatic, winner of a EU Prize for Cultural Heritage / Europa Nostra Award 2011. She advocated this successful initiative to the Croatian Ministry of Culture, which has resulted in the awarding of “Dry-stone construction skills” with a protected status of an “Intangible Cultural Asset of National Importance”. In addition to the success of this formal application, Julia Bakota explained how her organisation took a leading advisory role in drafting the registration documents and protection measures, and how they used the workshops held in the villages of Dragodid (Island of Vis) and Petrebišća (Nature Park Učka) to promote the almost forgotten dry stone technique. She also noted that this project used the technique of “crowdsourcing” to enlist the help of the public in inventorying dry-stone heritage. The third speaker, Daina Glavocic from NGO Protopedo, Rijeka (Croatia), shared the project “Adaptive Re-Use of Industrial Heritage from 19th century – the redevelopment and revitalization of the former Rikard Benčić complex” (a former Sugar, Tobacco and Motor Factory). Daina Glavocic laid out plans for re-usage of the old industrial buildings which are part of this complex: plans to re-use the former Headquarters of Sugar Factory (1786), with wall decorations from 19th century, as a City Museum, the former Cigarette and Cigar Factory (1900) as a Museum of Modern & Contemporary Art, the former Tobacco Dryer Building (1893) as a Future Children’s House, the former Virginia Cigar Factory as a City Library, and the Railway Warehouses (1881) as a City Bus Station. Rijeka will host the 8th International conference of industrial heritage “The Renewal of the Industrial Heritage” in 2018 and will be one of the two European Capitals of Culture in 2020. These case studies clearly confirm some of the key findings of the Cultural Heritage Counts for Europe Report – cultural heritage provides European countries and regions with a unique identity that forms the basis for effective marketing strategies aimed at developing cultural tourism and attracting investment, becoming a significant creator of employment across Europe. Moreover, post-industrial heritage, such as “Rikard Benčić complex” in Rijeka follows the examples of Creative Industries Quarter in Sheffield (UK) and Tate Modern in London (UK) that became a paradigm of good practice for developing cultural creative quarters.